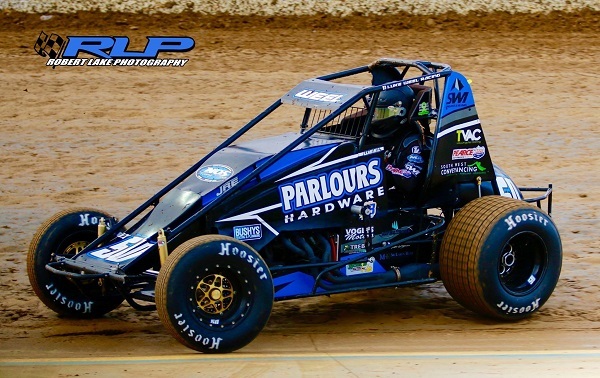 The Victorian pair of Luke Weel and Michael McDonald emerged triumphant in the opening night of the Australian Wingless Sprint Championship preliminary feature races at Warrnambool’s Premier Speedway. In what were two hotly contested 20-lap preliminary feature races, where each of the events had four spots available to lock into tomorrow night’s Australian Championship-deciding feature race, McDonald (pictured below) scored a major boilover to score the win ahead of determined Mitchell Broome (SA), Daniel Storer and Ash Hounsfield (WA). The following preliminary feature race saw local Luke Weel score the win and defeat Alex Ross, Jarmin Dalitz (SA) and 2013 Australian Champion Brett Milburn. The first of the preliminary feature races saw McDonald start from pole position and convert it into a win. The likes of Broome and Storer threw everything at McDonald, but in the end, he was able to withstand the pressure. McDonald, Broome, Storer and a hard-charging Hounsfield all locked in their places into tomorrow night’s feature race. Just missing out on a top-four finish in fifth was Chris Halesworth, who put in a career-best drive to finish to narrowly miss out on fourth. Behind Halesworth was Jason Bates (NSW), Dayn Bentvelzen, Jeremy Beddison, Andy Hibbert and Jake Ashworth (SA) in 10th. The remaining finishes in preliminary feature race # 1 were Brad Whitchurch (Tas), Clint McLaren, Steven Hateley, Brad Foster, Kelvin Johnson, Wayne Logue, Adin Robertson and Darryl Sloan (SA). There were only two non-finishes and they were Michael Skene (crash) and veteran Viv Rockliff (mechanical). In the second preliminary feature race, Weel (pictured below) paced the field for the entire distance and in the process went a long way towards claiming his maiden Australian Championship win. Weel at the fall of the chequered flag came out on top ahead of Ross and Dalitz in second and third place respectively. Milburn ended up fourth and was the driver to lock in a spot in tomorrow night’s feature race. Brett Ireland (SA) ended up in fifth ahead of Luke Storer, Travis Millar, Luke Redpath (Tas), Cody Boulding (NSW) and 10th place finisher Ashleigh Jack (NSW). The remaining finishers were completed by local Tim Van Ginneken, Marcus Green, Troy Carey (NSW), Matthew Balcombe, Carly Walsh, Sam Wren, Jamie Mills, Chris Rodda, Josh Padman (Tas) and veteran Peter Logue. Earlier in the night there were two rounds of heat races, and the wins were shared between Skene, Broome, Halesworth, Beddison, McLaren, Milburn, Walsh, Ross, Dalitz, Carey, Ashworth, Foster, Daniel Storer, Michael McDonald, Tony Moule, Millar, Van Ginneken, Redpath, Rodda and Weel. In the heat-race action there were plenty of thrills and spills during the 20 heat races, but the biggest occurred in the second round, when defending and two-time Australian Champion Joel Chadwick (SA) was in the wars. Chadwick was caught up in an earlier incident that caused enough damage to not only rule out of action for that heat race but the rest of the night. The Wickett Racing team is now working hard to fix the damage to the Aus # 1 car in readiness to come back tomorrow night. Getting underway with scrutineering, practice and the calcutta on Thursday, February 21 the last of the scrutineering will be completed on the morning of Friday, February 22 before drivers contest two rounds of heat races on Friday night, with the top-40 drivers in the point standings going on to complete two odds and evens preliminary feature races. The first four finishers in these preliminary feature races will qualify directly into Saturday night’s feature race and will compete in the Champions A-Scramble to determine their starting positions. Following the opening night of competition, the top 96 cars in points, excluding the eight drivers who have already qualified for the feature race, will return to the track on the Saturday night of February 23 to contest a final round of heat races. The top 8 in points will then qualify directly into the feature race and will compete in the Mid-Pack B-Scramble to determine their starting positions. The next 32 drivers in the point standings will qualify directly into two B mains, while other competitors will contest one of four non-qualifier events to determine qualifications into the D main and two C mains, with the top four in each main progressing through to the back of the next main. Once these mains are complete and the final feature-race transferees are confirmed, 24 drivers will take to the track for the 40-lap Australian Championship feature race. 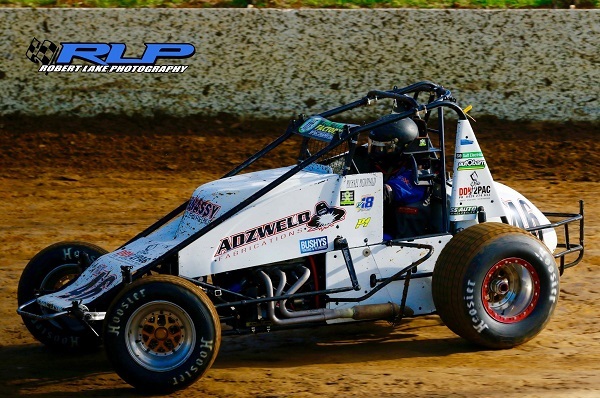 For more information about the AWSR, visit their website at www.awsr.com.au or LIKE them on Facebook or Follow them on Instagram and Twitter by searching Australian Wingless Sprint Racing.